In Nepal, agriculture accounts for 34 percent of the GDP and employs 70 percent of the population. Thus, shifts in weather patterns, soil content, and market prices can easily have ripple effects on the population. To track these variables, satellites, weather stations, governments, and researchers regularly capture agriculture data. Historical information on weather patterns, crop yield and market prices provides valuable insights and can predicts future trends. However, this data is rarely consolidated and made available to farmers. Recognizing this gap, The United States Agency for International Development (USAID) launched the Data-Driven Farming Prize. The prize seeks tools and approaches that source, analyze, and translate data into actionable and timely specific information for small-holder farmers. Partnerships are a core part of USAID’s DNA. That is why the Agency, working with the Challenge Prize Centre at Nesta, collaborated with local research institutions such as CIMMYT, the International Maize and Wheat Improvement Center, ICIMOD, the International Center for Integrated Mountain Development, and GODAN, Global Open Data for Agriculture and Nutrition, as well as the the Kathmandu-based Microsoft Innovation Center Nepal, to design the prize. In an effort to “free the data,” the prize platform made a number of relevant data sets available, and created an interactive geonode platform. Finally, the prize was grounded within the Nepal Feed the Future program and its prioritized agriculture value chains. These partners used their networks to amplify the prize call, leading to 143 applicants from around the world, including 83 from Nepal. They were all also involved in the judging process, leading to 13 finalists, six of which were from Nepal. The strong response from local applicants is a testament to a simple application process, Nepal’s’ strong ecosystem of innovators, incubators and researchers, and the tremendous reach of local partners. The prize clearly succeeded in incentivizing innovations. For example, Db2map, a Nepali company using satellite data had not previously thought about expanding its services to the agriculture space –until they heard about the prize. Farming Online, a UK-based commercial entity was already using satellite and machine learning to identify crop types and crop help with small-holder farmers. The company had previously thought about expanding their operations into East Africa, before learning about the prize and realizing that Nepal was an ideal market for expansion. Team Spero, two University of Toronto engineers, decided to created a soil moisture meter in their local maker space after learning about the prize. 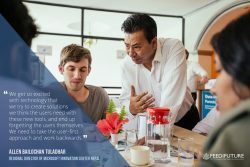 All 13 teams were invited to a three-day co-creation workshop in Kathmandu, where they were able to interact with data experts, mentors, and end users. Representatives from CIMMYT and ICIMOD provided valuable feedback to innovators on how to leverage and analyze existing data sets to improve their products and the Microsoft Innovation Center led workshops on the Lean Start-Up model and user-centered design. A“haat bazar” allowed finalists to share their prototypes with agriculture entrepreneurs, extension workers, and farmers, who offered feedback on product applicability. Evenings were also filled with opportunities to network with investors, government officials and agriculture entrepreneurs. During the co-creation workshop, local agribusinesses approached the innovators about their products and offered to test their prototypes on their farms. Additionally, CIMMYT, ICIMOD, and USAID identified a handful of innovations that can support their programs. Following May’s co-creation workshop, finalists will have 10 weeks to further refine and test their prototypes. This will be supported by $2,500 of seed funding, testing support from CIMMYT, a virtual accelerator led by the Microsoft Innovation Center, the support of designated local mentors, and access to the various experts involved with the prize. Leading up to September’s awards ceremony,the finalists will have the opportunity to share their final products with farmers, investors, agri-businesses and development agencies. Ultimately, only four prizes will be awarded: two at $100,000 and two at $50,000. By establishing connections between the innovators and other ecosystem actors throughout the process, the intent is for many of the finalists to use the networks formulated via the prize to establish new client relationships and secure additional funding sources. As the prize offers a chance for finalists to refine their products, network, and build evidence for their efficacy, all finalists benefit from this prize regardless of outcome. 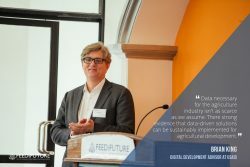 The Data-Driven Farming Prize demonstrates that a smart design process and strong partnerships can ensure all stakeholders benefit in the implementation of a prize. 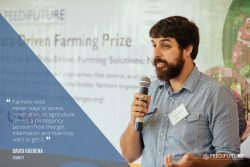 By engaging with a wide range of partners at the beginning of the design process, and working with innovators to improve their products throughout the process, the Data-Driven Farming Prize ensures that all the finalists, partners and ecosystem actors will see value throughout and beyond the lifetime of the prize.